Ar·ab [árr?b] noun (plural Ar·abs) member of Semitic people: a member of a Semitic Arabic-speaking people who live throughout North Africa and Southwest Asia adjective peoples Same as Arabian [14th century. Via French and Latin < Greek Arab- < Arabic arab] Arab, Arabic, or Arabian? 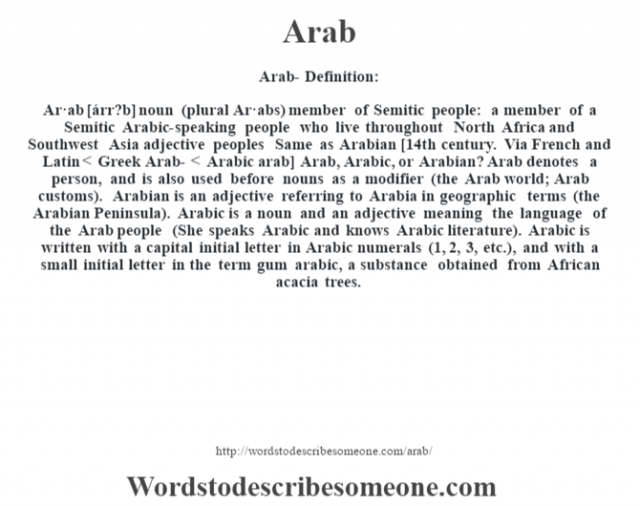 Arab denotes a person, and is also used before nouns as a modifier (the Arab world; Arab customs). Arabian is an adjective referring to Arabia in geographic terms (the Arabian Peninsula). Arabic is a noun and an adjective meaning the language of the Arab people (She speaks Arabic and knows Arabic literature). Arabic is written with a capital initial letter in Arabic numerals (1, 2, 3, etc. ), and with a small initial letter in the term gum arabic, a substance obtained from African acacia trees.